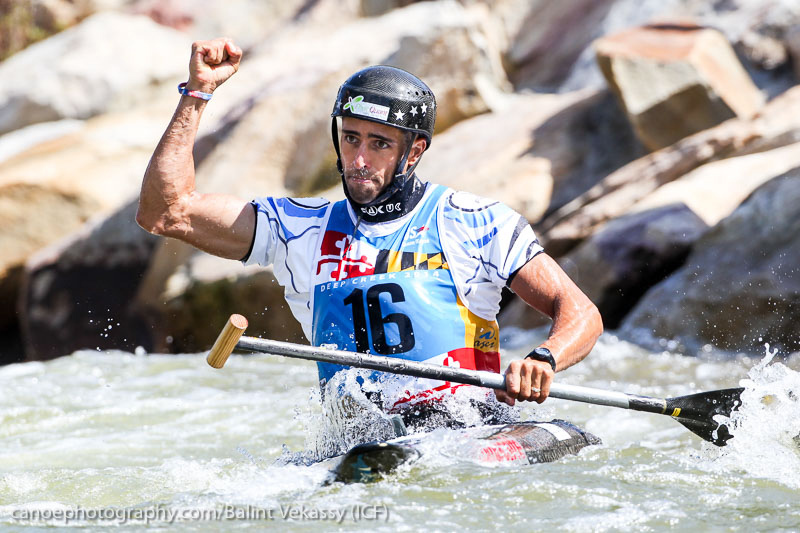 Thanks to France’s Fabien Lefevre, the U.S. made it to the medal stand at the 2014 ICF Canoe Slalom World Champions in Deep Creek, Md. Now paddling for the U.S., Lefevre, in only his second season competing internationally in C-1, used his speed and boat positioning to win the gold medal in C-1. But that was it as far as podiums for the U.S.
Benjamin Savsek (SLO) took the silver, adding to his bronze from last season’s World Championships, with Germany’s Franz Anton completing the podium. In Men’s K-1, Lefevre’s former teammates proved their prowess, with France making it a clean sweep. France’s Boris Neveu, Sebastien Combot and Mathieu Biazizzo took the top three spots. Michal Smolen finished in the highest U.S. position, taking 13th based on his semi-final results, with teammate Richard Powell finishing 16th. In the women’s events, it Australia’s Jessica Fox’s time to shine. Coming on the heels of her women’s K1 silver medal in the London Olympics, Fox won the gold in both the Women’s C-1 and K-1 categories, becoming a double-World Champion. First came her win in C-1, where the 20-year-old appears to be an unstoppable force. Despite making a couple of errors, her flat line speed was enough to secure gold. “It was a really tough battle, but I was happy to cross the line in first despite a few errors,” she says. “I charged it down from the top section and kind of didn’t stop until the finish. I always feel a bit of pressure and you know being the world number one and winning a few World Cup races there’s always a little bit of expectation, but I like that.” Mallory Franklin (GBR) also repeated her efforts from the 2013 event in Prague, winning the silver for the second time at a World Championships, with Oriane Rebours (FRA) collecting the bronze. Fox rose to the top again in Women’s K-1, finishing in 114.01 to second-place finisher Fiona Pennie of Great Britain 0.97 seconds back. Germany’s Melanie Pfeifer took the bronze at 120.01. The highest-placing U.S. female in K-1 was Dana Mann, taking 23rd. France’s Pierre Picco and Hugo Biso gained the silver in men’s C-2, with Ladislav and Peter Skantar (SVK) winning their second World Championship bronze in as many years. For the U.S., Devin McEwan and Casey Eichfeld finished 15th.